Toyota Lincoln are proud to help raise money for the St Barnabas Hospice at the Fashion Show at Waterside Shopping Centre on 19th September. 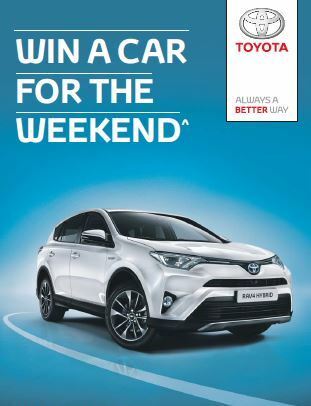 We are offering the chance for someone to win a Toyota for the weekend by having a competition for visitors to guess the number of balloons in the car. So why not come along and have a go? ^Terms and Conditions apply: Exact vehicle to be advised once the prize is claimed. Proof of identity may be required. Insurance requirements apply. Must hold a valid UK Driving Licence and proof of fully comprehensive insurance cover. Excludes GT86 and Land Cruiser. The car must not be taken out of the UK or exceed 500 miles. There is a £250 excess of an accident. Drivers must be aged between 25 and 70 and have no more than 6 points on their licence and have not been involved in more than 1 motoring accident or claim in the last 3 months. Drivers must have no medical problems. The winner will have use of the car from Friday at 2pm until Monday 9am. Prize must be claimed by 31.10.18. Winner will be selected at random under independent supervision and notified by phone or email. No cash prize alternative.